This was the eighth Coach and Bus Show organised by the Coach Transport and Tourism Council for Ireland, (CTTC), the country’s independent trade association, at the RDS in Simmonscourt, in the suburbs of Dublin. The show is held every two years and when the last one happened in 2012, Ireland was still deeply in economic troubles and the atmosphere was pretty subdued. This year the atmosphere was very different. With the economy now moving positively in the right direction, although still with a long way to go, there is a feeling of more confidence around and people are buying vehicles. Finance is now easier to achieve, though still not easy, and tourism, especially the vital incoming tourism which has always been a key factor in the Irish picture, is markedly improved. This is especially the case for the vital incoming tourism from the USA and Canada which have always been of major importance. The situation is improving, though taxation remains eye wateringly high, unemployment is dropping, albeit slowly, and people generally feel a bit better off. The bus and coach market in Ireland is complex compared to the UK. Whilst the independent sector enjoys relative freedom as far as private hire, excursions and tours work is concerned, the stage carriage bus and express services remain massively dominated by the State operations of Dublin Bus and Bus Eireaan. However, there are real signs that this is beginning to change, at long last, with discussions going on between the stakeholders via the CTTC, the Government and the Unions. The latter have always been hugely powerful. What is different this time, is that there does seem to be real determination to find a solution to the problem. This is not just altruism from the Irish government, it is itself coming under mounting pressure from Europe which is unhappy about the level of subsidy it passes to the State operations. Many genuinely feel that this will be the catalyst that will bring about change, but it will not happen fast. This year’s show was the first to be organised by the CTTC’s new CEO, Kevin Traynor, although he does receive a lot of help from the executive and members. It drew on the success of previous events but also improved on them, certainly in terms of layout, and being back in one hall was a great benefit. The Show was opened by one of the stalwarts of the industry and a founder member of the CTTC, Dermot Cronin, of Cronin’s Coaches from Cork. I’ve known the Cronin family since way back in the ‘60s when they not only ran, but sold AEC coaches in Ireland. 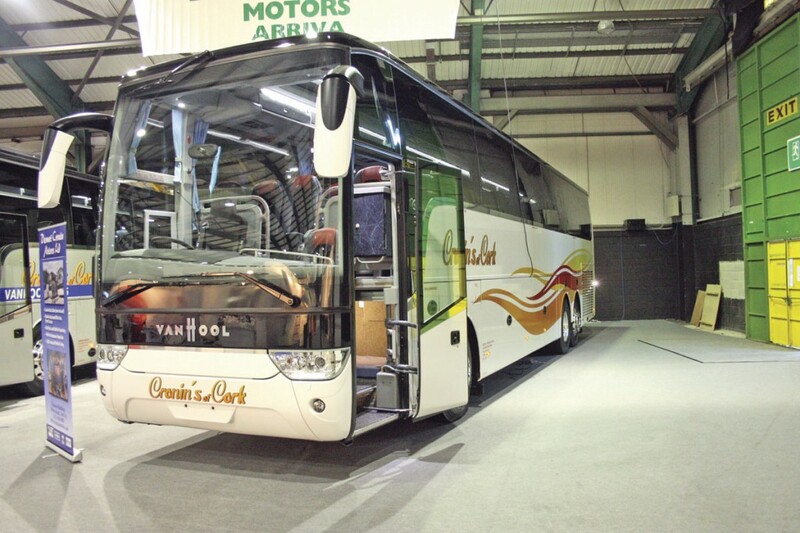 These days, apart from still being a major coach operator, they also continue to sell Van Hool coaches in Ireland. He was assisted by John McGinley the current CTTC Chairman and from another long established coach operation based up in the far north of Ireland in Donegal. Obviously with the Show happening so close to EuroBus Expo there were a number of vehicles appearing at Dublin which had been seen at Birmingham but there were also a lot that hadn’t. Like the UK, Ireland is a market where the Mercedes-Benz Vario has been a key vehicle over many years so it was no surprise that the ‘New Vario’ sector contenders figured heavily. The first stand in the hall belonged to Unvi who have long been a popular supplier into Ireland. They are represented in Ireland by Central Bus and Coach and Martin Daly’s LIR Coach and Bus Sales both supported by Unvi UK. Unvi showed three vehicles. Their Vario replacement contender, the Voyager GT, which is based on the 10 tonnes Mercedes-Benz Atego chassis, took pride of place. 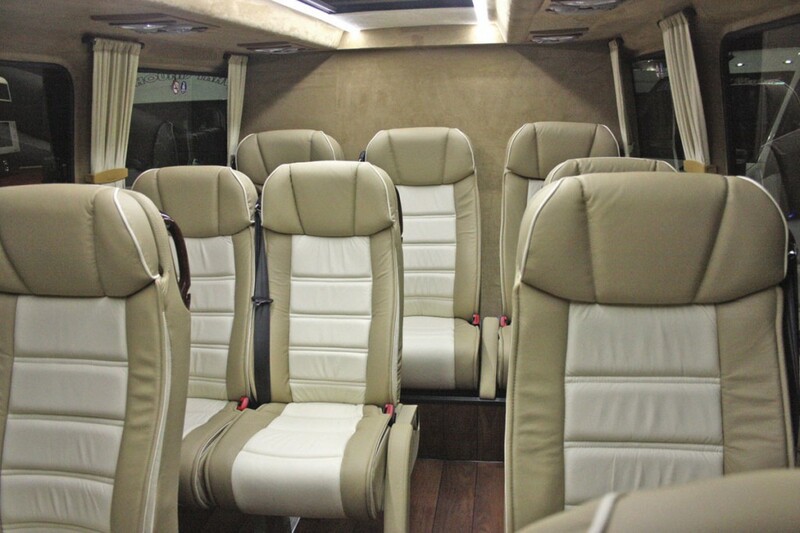 This was indeed one of the vehicles which had been at Birmingham, the luxuriously appointed 30 seater. No changes to the styling were seen but work is progressing at a pace and I was shown pictures of what the modified front end will look like and I can confirm that it remains very stylish but perhaps not quite so radical. Speaking to David McKinless from Unvi UK and Alex LeCompte, Head of Export Sales for Unvi SA, about the reaction they had received at Birmingham, they told me that most of it was very positive and they had received a good level of orders, but they also confirmed that there were a few key customers who were less sure about the styling. Far less controversial were the Touring midi coaches. Both the front engined GT and the rear engined GTR have been as well received in Ireland as they have in the UK. On show were examples of each. 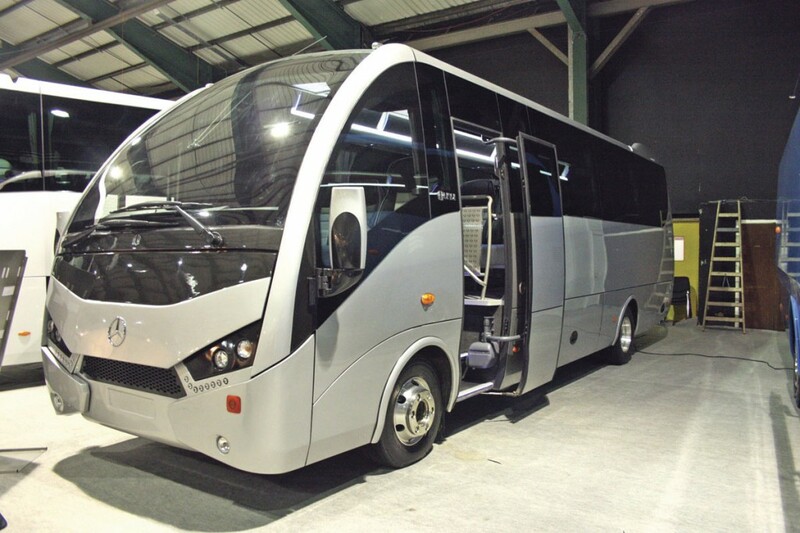 The rear engined MAN powered GTR was shown as a 43 seater and was destined for Ocean Executive Coaches of Portalington, County Laois whilst the forward engined 15-tonne Mercedes-Benz Atego based GT was a 41 seat example. King Long have had some success selling in Ireland in the past, but as with the UK they chose to not exhibit in Dublin. Instead the Chinese flag was flown, as it had been in Birmingham, by two new contenders. These were the 9.35m Yutong TC9 and the 9.225mm Higer Storm 1. The Yutong was a different example from that seen in Birmingham. It was a 35 seater destined for Irish operator Kearney’s Coaches. The vehicle has a rear mounted Cummins ISB6.7 280hp engine matched to ZF automatic transmission. The product is being sold in Ireland, as it is in the UK, by Pelican Engineering. The Higers on the stand were also different vehicles from the one exhibited at Birmingham. There were two of them inside the hall, both were 9.225m long Storm 1s fitted with 35 seats but different levels of trim standard and equipment specification. Here they used the rear mounted Cummins ISB6.7 engine rated at 250hp and the Allison T270R automatic transmission with hydraulic retarder. 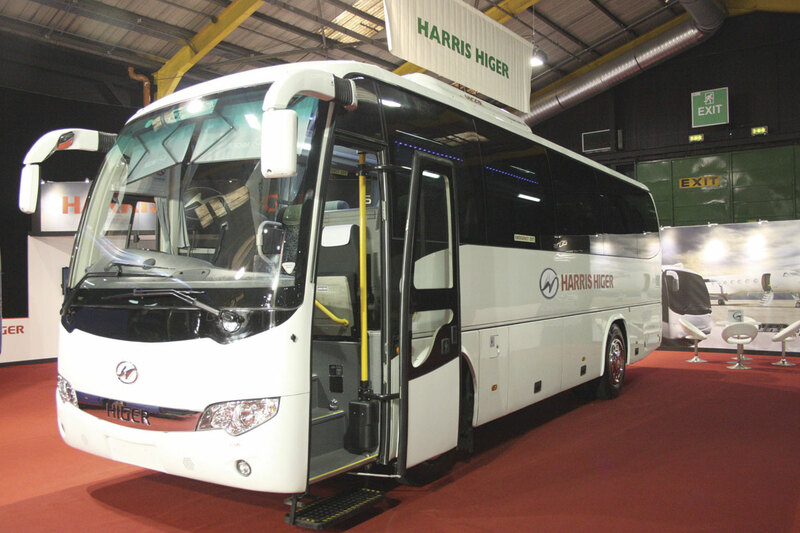 Harris is a well respected name in the Irish vehicle industry and it is an Irish company. It is responsible for the importation of the product. In fact there was a third Higer Storm 1 at the event, because another was being used for the driving skills challenge that the CTTC always holds. I watched this for some time and couldn’t help noticing that the vehicle did not appear to have a very good turning circle for a relatively small vehicle, certainly some of the competitors seemed to be struggling with it. Eworc is a new name in the world of minibuses, but not a new face. If you turn the letters of the title around it spells Crowe, namely Martin Crowe, who for many years was the principal designer and bodybuilder at KVC in Kilbeggan. 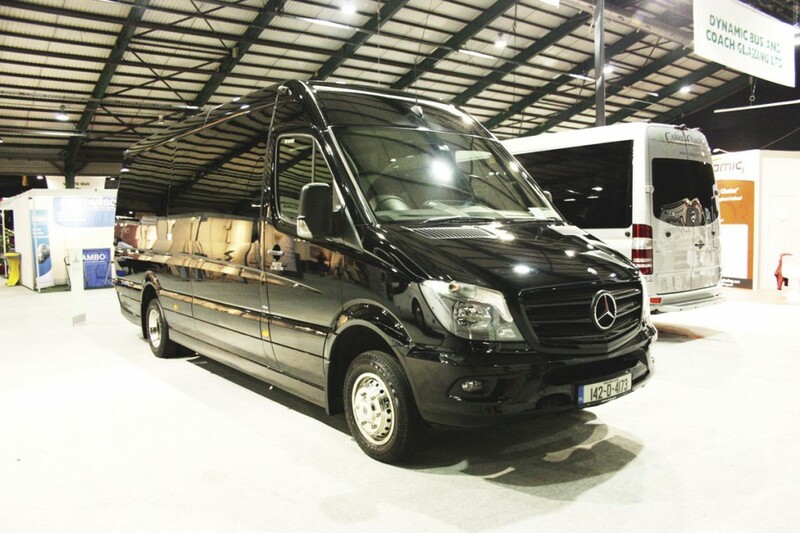 Now operating his own business, out of premises in Mullingar, Martin showed a range of high quality conversions based on the Mercedes-Benz Sprinter. Martin has always been one of the most skilful vehicle converters around, so the quality of the end product was no surprise. Sales are being handled by his former colleague Martin Daly at LIR Coach Sales who happens to be based right next door to Eworc’s facility. Martin showed three vehicles. The first was a Sprinter 516 with cab entrance doorway and seating for 16. It was to a high specification with quality internal trimming, bonded double tinted glazing and a boot. It was destined for J.B.Killeen of Dublin. Eworc’s second vehicle was a very luxurious version of the 516 Sprinter. This had a plug door entrance aft of the front axle, a very high level of interior trim and nine luxurious seats, some of them set at tables. It is destined for Carrig Coaches. The third vehicle was unusual to UK eyes, being a Nissan NV400. Nissan vans have a generally wider market acceptance in Ireland than they do in the UK. The very well appointed interior was able to seat 12. Martin is to sell his products in the UK and would be interested in hearing from anyone interested in representing Eworc. Barton Coaches of Maynooth, is another very old established family business which not only runs coaches but sells them as well. These days much of the running of the business falls to Fergal Barton but his father, Pat’ another old friend of my mine, is still involved. Old business, but new product. I normally associate Bartons with Plaxton, Jonckheere and Berkhof products but this year they showed a very nice Beulas Cygnus 49 seater having recently taken the franchise over from neighbours Noones, who have had it for many years. The coach, which will operate in Barton’s own fleet, was based on the VDL SB4000+ rear engined chassis with a Euro5 DAF Paccar engine matched to ZF automatic transmission. They also supply the same vehicle mounted on the MAN chassis with Euro6 engine and ZF (TipMatic) automated transmission. The one on show was to normal touring specification with 49 seats, continental exit and centre sunken toilet. EVM has its manufacturing base in Ireland at Kilbeggan in County Westmeath and it presented three vehicles, two of which were destined for Irish operators. Heading the display was a Sprinter 516 automatic conversion with an entrance behind the front axle fitted with a plug door. It was to the usual very high standard of internal appointment and trim and equipped with seating for 16 with a large dropwell boot. It was destined for Extreme Ireland for operation on their day tour programme. Alongside it was a second Sprinter 516 automatic, again featuring a high level of internal trim and equipment and this time fitted with 24 seats. The rear two rows of seats were track mounted with quick release fixings allowing the seats to be easily removed to create a luggage space for which a separate quick fix bulkhead is supplied. You expect Danny McGee to come up with something special and he didn’t disappoint. This time it was an unusual Sprinter for him to convert, a shorter 316 model. 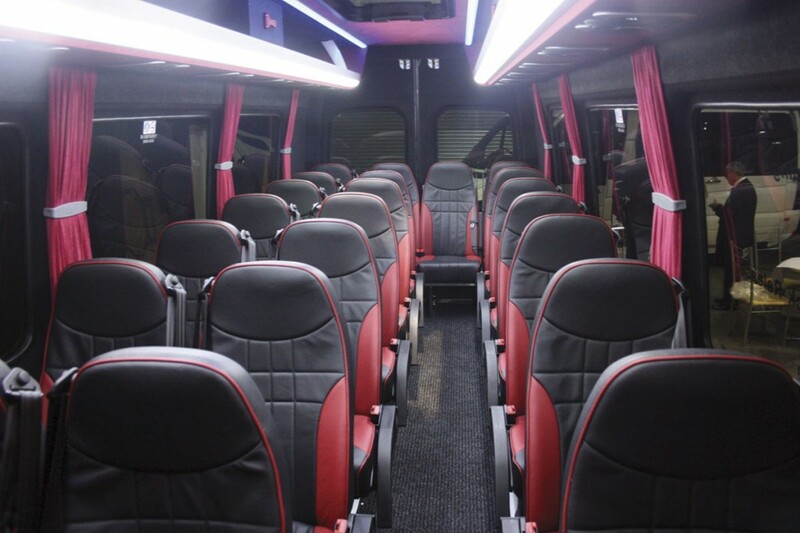 It had a sliding door entry with extra step, a high level of internal trim and equipment and just eight luxurious seats with four of them set at a table. It also had a small luggage space. ‘Just testing the water,’ exclaimed Danny. Cronins showed two very nice Van Hool coaches. The largest exhibit was a 13.2m three-axle TX16 Alicron powered by a Euro6 Paccar MX engine developing 326bhp matched to ZF AS Tronic transmission. It had 49 seats with some at tables although it can be seated at 53. Other equipment included a driver’s bunk, courier seat, continental exit, sunken centre toilet and a dash fridge. Their second exhibit was particularly interesting. This was a 12.2m TX15 Alicron fitted with a DAF Paccar Euro5 265bhp diesel matched to ZF automatic transmission. It had 49 seats a number of which were track mounted and removable because the coach was also fitted with a side mounted Dhollandia wheelchair lift and special door for loading wheelchair passengers. It had the capacity to carry up to four wheelchairs. Special call assistance buttons adjacent to the locations where wheelchair passengers would be positioned were a nice touch. Other features included a continental exit and a rear saloon toilet. Another Irish minibus converter started by two former KVC employees is Paramount Conversions based in Tullamore. They are celebrating their fifth year in business. They put on a fine display of quality conversions. 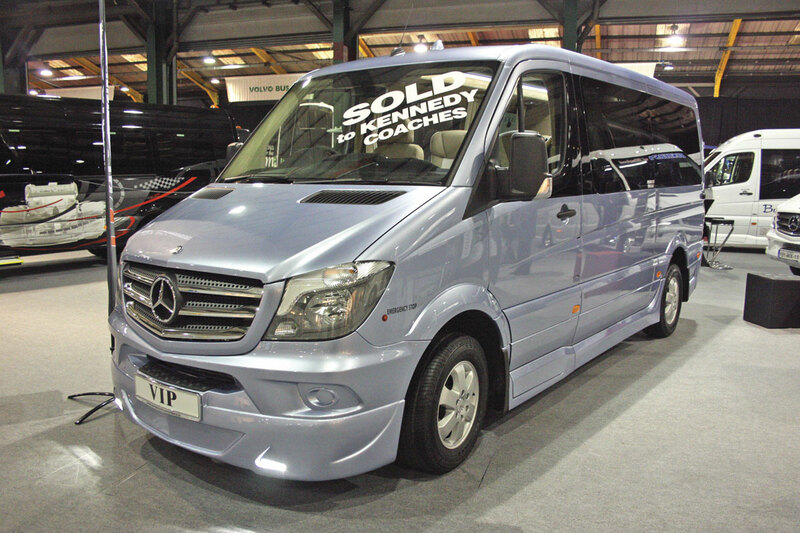 Leading the line-up was a Sprinter 516 manual with cab entry, high internal specification interior and a drop well boot. The vehicle seated 16 with some seats set at tables and was destined for Connemara Coaches. Alongside that was another Sprinter 516, this time with a full height entrance and plug door. Another 16-seater, the minicoach also featured a glass roof and alloy wheels. It was destined for Bushers of Wexford. The third exhibit was yet another Sprinter 516, this time a manual. This had the cab entrance style and seating for up to 19 with seats on tracks enabling wheelchairs to be carried. These are loaded using a Ratcliff Palfinger rear, underfloor, cassette type, tail lift. It was destined for their home town operator K.Buggy Coaches of Tullamore, County Offaly. Parmount’s fourth vehicle was another accessible Sprinter 516 manual. It again featured a converted cab entrance arrangement and a Ratcliff Palfinger wheelchair lift at the rear. 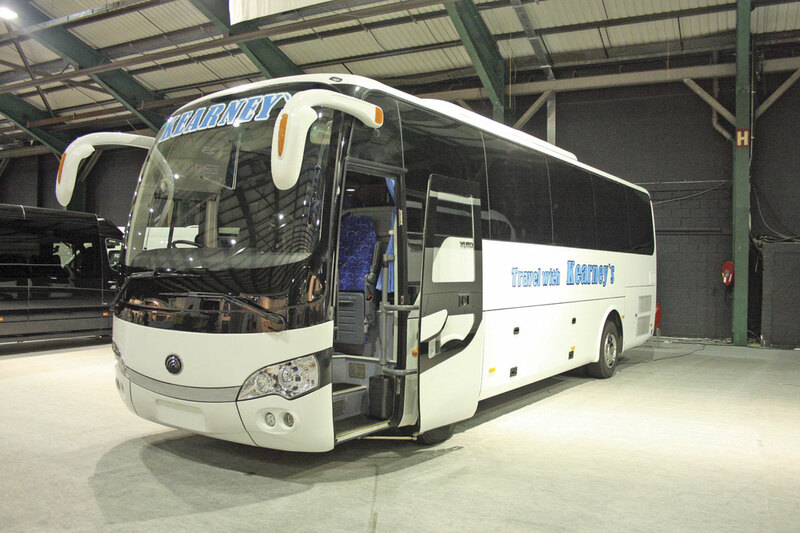 It differed in having 20 seats and was built for Foxhound Travel of Rockcorry, County Monaghan. The final exhibit was called a VIP and was another Sprinter 516 auto. It was trimmed to a very high standard using luxurious soft feel materials including suede, a wood effect floor and a glazed roof. It had just nine very luxurious seats and was destined for Kennedy’s Coaches of Annascaul in County Kerry. I met Mr Kennedy and he was absolutely delighted with his new vehicle. 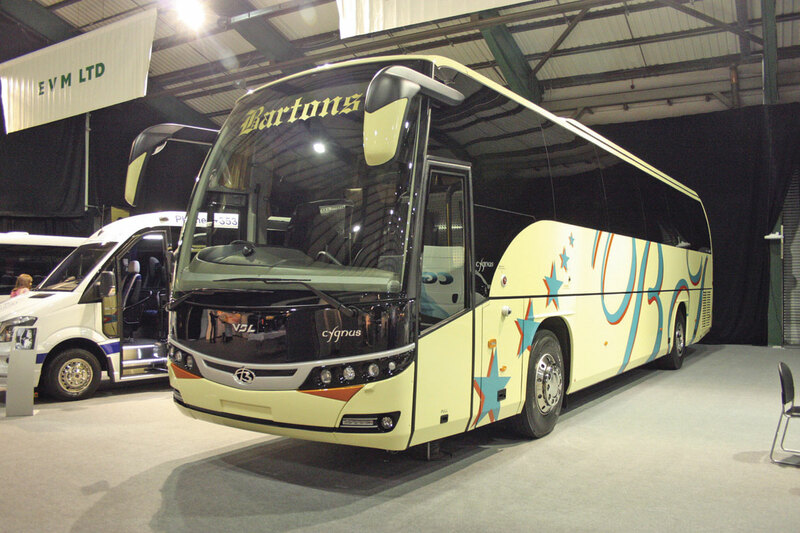 EvoBus used to be a major player in the Irish market as far as large coaches were concerned with the Setra range being very popular. Since having to rely just on the Tourismo to bridge the gap they have seen their position fall. However their factory produced minibuses are popular. They showed a 13 seat Traveliner 45 which had an extra entrance step and luggage space. They also showed a Sprinter Travel 45. This had seating for 19, an extra entrance step and a drop well boot. It uses a special chassis which enables it to be fitted with a very solid tow hook for towing a luggage trailer. The Tourismo on show was a 12.2m version with 42 seats, some set at tables, a rear saloon toilet and a continental exit. All the Moseley companies sell in Ireland though Moseley in the South usually man the Dublin stand. They brought two of their possible Vario replacements with the Indcar Next and the Sitcar Voyager. They could not bring their other contender the Beulas Gianino because they do not hold the Beulas franchise in Ireland. The nicely styled and well appointed Indcar Next was the left hand drive example introduced at Birmingham. Built on a 12-tonne Atego chassis it had seating for 38 although Indcar do make this model in a range of sizes and even wheelchair accessible. The Sitcar Voyager was again the vehicle from Birmingham built on an Iveco Daily 70C17 seven-tonne chassis and able to carry up to 25 passengers. Their largest exhibit was a VDL Futura 2. The example was a 12.9m version with 11-litre DAF/Paccar MX engine matched to a ZF EcoLife fully automatic transmission. The full touring coach internal specification included a continental exit and centre sunken toilet. It was fitted with 57 seats. Pat Caton of Westward Scania is another long time colleague. He has been the dealer’s number one bus and coach expert for many, many years. Pat often shows a Scania based Van Hool coach, because it is a popular combination in Ireland. 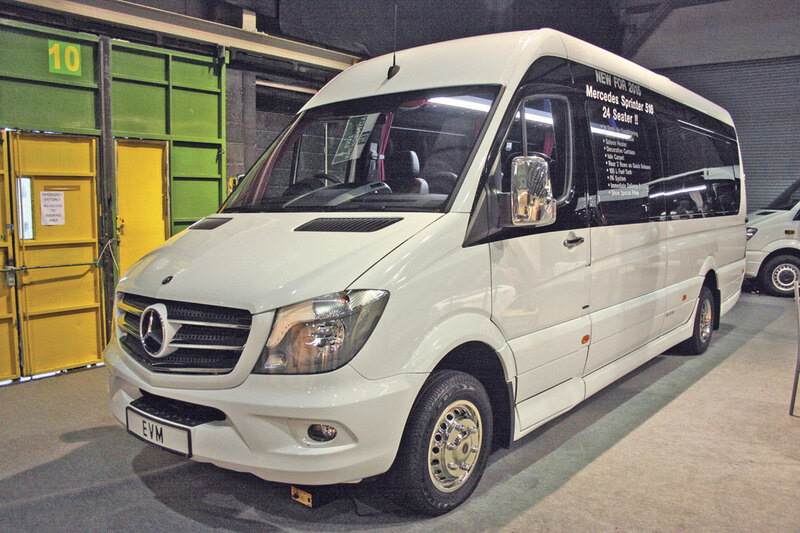 It is a model that has not been available in the UK for some years although Moseley announced at Euro Bus Expo that they are going to start selling them again – the vehicle they showed in the outside area was actually a Westward vehicle because they couldn’t achieve delivery of one of their own. This year Pat concentrated his display on Irizar bodied Scania products. By far the largest was a 13.9m Irizar i6 fitted with a 410bhp Scania Euro6 engine matched to 12-speed Opticruise transmission. It seated 65 but Pat told me that he is about to deliver 20 similar vehicles to Bus Eireann which will be wheelchair accessible. This one was in the colours of Collins Coaches, another renowned CTTC operator. Alongside it was another for the same fleet, this time a two axle version with 360bhp engine and eight speed Opticruise transmission. It had seating for 53. The final exhibit was a 12.4m Scania based Irizar Century featuring seating for 53, a continental exit and centre sunken toilet for the Dualway fleet. After being in the doldrums for some years Bus Eireaan has begun to order vehicles again and Pat is delighted that they have decided to remain with Scania which is the dominant marque in their sizeable coach fleet. The Noone family have been major players in the Irish vehicle market, both trucks and coaches, over decades. The company is now run by the sons and the PSV side by the brothers Michael and Mark. Noones have been distributors for a range of products over the years, particularly Indcar and Beulas, but two years ago they decided to start importing their own vehicles which are produced for them in Portugal. Teaming up with Alan White’s Minis to Midis in the UK they launched the Turas range of mini and midi coaches onto the market and have been highly successful with them. They used the Show, as they had Birmingham, to launch their new Vario replacements the Turas 900 and the Turas 700. Top of the range is the Turas 900 33 seater mounted on a nine-tonne Mercedes-Benz Atego chassis with the steering position moved back to enable the engine to be kept out of the saloon and the entrance under the driver’s view. The coach on display was the same high specification 33 seater we saw in Birmingham and was as well received in Dublin as it had been at the NEC. 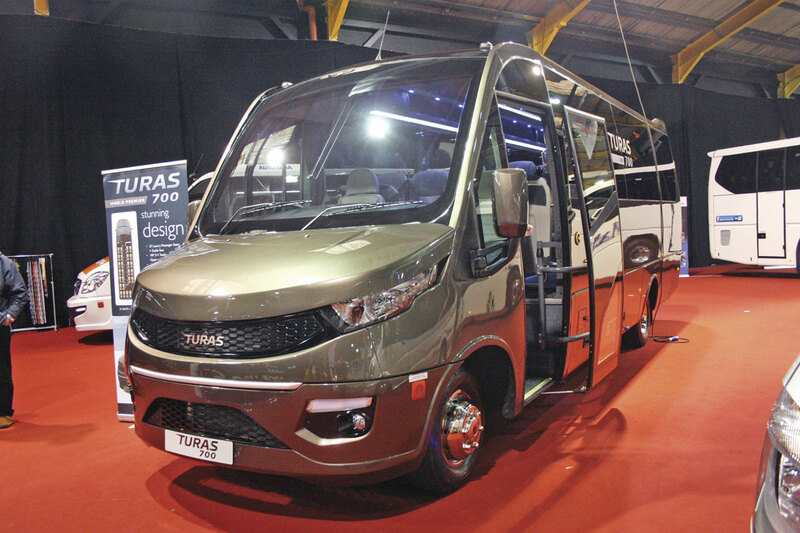 Unlike the rest of the Turas range this model is being built in Turkey. The Turas 700 shown was also the same vehicle seen in Birmingham. 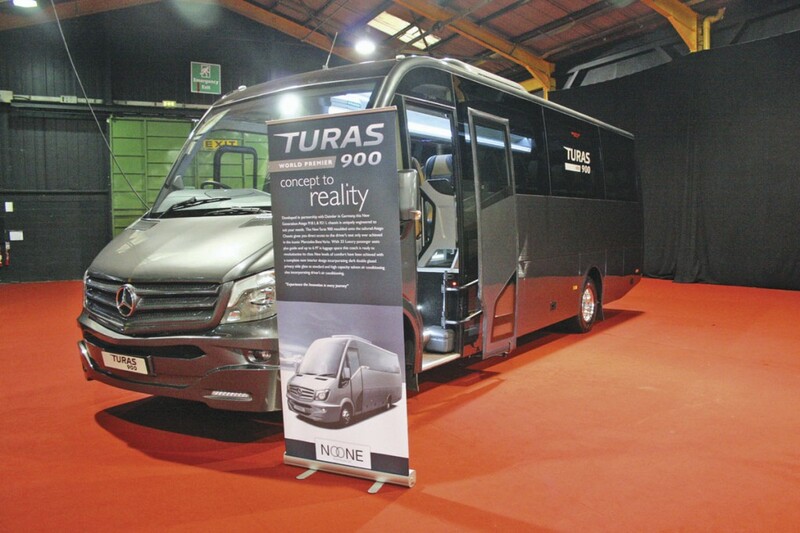 The Turas 700 is a mid range 25-27 seater built on a seven-tonne Iveco chassis. This model is built in Portugal. There were also three Portuguese Turas 500s built on the 516 Sprinter base. Two were coachbuilt and one was a van conversion (500C). One of the 500s and the 500C were well appointed 16 seaters with good rear boots and were destined for Irish operators. The second Turas 500 was also built for an Irish operator, Airport Hopper, which runs a shuttle service between the Dublin fringe towns of Maynooth and Tallaght to the Airport. This vehicle had seating for 19 and plenty of boot space. 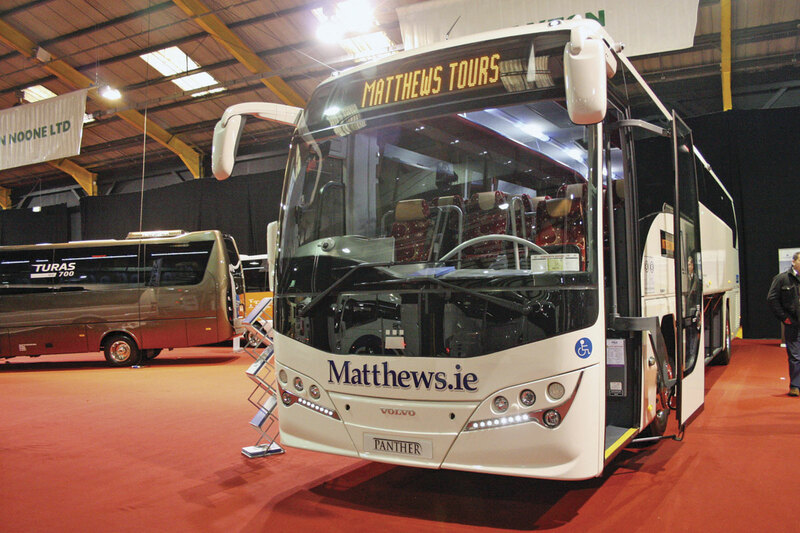 Plaxton exhibited just one vehicle, a 12.6m Panther destined for one of Ireland’s main operators, Matthews of Inniskeen in County Monoghan. The coach was mounted on a Volvo B11R engined chassis with I-Shift automated transmission. Of particular interest was the fact that it was fitted with a wheelchair lift in the entrance as pioneered by National Express. It had seating for 53 plus a wheelchair at the nearside front occupying the space taken up by the courier seat and the front double. Volvo was the only manufacturer to show a service bus. This was a B5TL based double decker. It was fitted with a 240bhp engine matched to ZF automatic transmission. Bodywork was the Gemini 2 from Wrightbus with accommodation for 79 seated and 15 standing with the usual reduction in one seat if a wheelchair is carried. Although the vehicle carried no identity markings, from the maroon colour scheme I deduced it was actually a Lothian example making a little detour on its way to the Scottish capital. Alongside it was a 13m 9700 luxury coach. The 9700 has proved to be a successful vehicle for Volvo in Ireland. The vehicle had seating for 57. An interesting and very well supported event clearly indicating better times for the independent coach industry of Ireland after some very difficult years. The CTTC has campaigned long and hard for some measure of equality in the market and a reduction in the powers of the big State players and it now seems to be having a real effect. The fact that they have also formed an alliance with PAMBO, which has traditionally looked after the smaller operator, should see their influence grow even stronger.